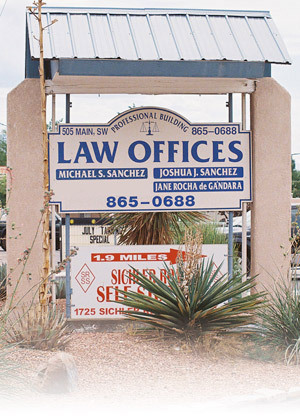 The Law Offices of Michael S. Sanchez has been serving Valencia County and the state of New Mexico for over 35 years. The Law Offices provides legal services in the areas of criminal defense, family law, personal injury, DUI and auto accidents. Our lawyers have extensive experience and expertise in these areas and know your legal rights concerning your case. Our lawyers bring a breadth of real-world experience to bear in developing creative approaches to the complex factual and tactical problems presented in the modern courtroom. The Law Office has leveraged its small size and use of skilled legal assistants to maximize the efficient and economical representation of its clients. The Law Office has been a staple in Valencia County and supports local businesses, high school academics and local sporting events. Michael S. Sanchez also serves the State of New Mexico as the Senator for District 29 in Valencia and Bernallio counties, he also serves as the Senate Major Leader.